Concerted and urgent action is required to address the alarming increase in serious injuries and deaths of cyclists over the last nine years. This includes life saving education and enforcement of minimum passing distance laws now in place or pledged in all states and territories across Australia, with the exception of Victoria. The benefits and opportunities of driver education campaigns for improving road safety for cyclists has been highlighted in a video (below) interview with the UK’s West Midlands Police about their minimum passing distance enforcement campaign, which was accompanied by a 20% reduction in deaths and serious injuries. Presented to a meeting of senior police from across Australia as part of the 2018 Australasian Road Safety Conference by We Ride Australia, the Amy Gillett Foundation and Bicycle NSW, the discussion continues many state-based conversations that Australian bicycle groups believe will lead to safer roads for all road users. The West Midlands campaign, which has now been adopted by over half of all UK County Police forces, uses a combination of education and enforcement to create safer environments for all road users. The need for such a campaign in Australia is stark, with a worsening road safety record that has seen a doubling of major trauma rates for bicycle riders over the last nine years[i]. In addition, the 2018 report of the Inquiry into the National Road Safety Strategy[ii] raised serious concerns for the safety of bicycle riders (and pedestrians) on Australian roads and made twelve recommendations to induce a ‘step-change’ that, if implemented, will transform road safety performance[iii]. 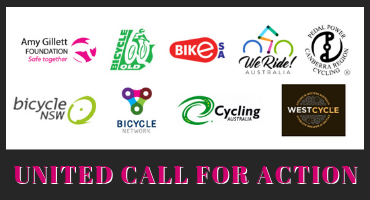 With close to 4 million Australians regularly choosing to ride a bicycle[iv], Australia’s cycling groups are calling for greater investment in education and enforcement of safe passing distance of bicycle riders. We Ride Australia’s Stephen Hodge said “the co-author of the Government’s recent Inquiry into the National Road Safety Strategy said a ‘crisis of complacency’ and lack of leadership is preventing progress on reducing our road toll[v]. “The video organised by We Ride Australia is a great example of a highly effective education and enforcement program and we hope more can be done to conduct similar campaigns here,” Hodge said. Amy Gillett Foundation CEO, Phoebe Dunn said “combined education and enforcement can be highly effective in increasing safety for all road users and cyclists in particular. “We are pleased to be discussing a range of issues around cycling safety with police nationally, including enforcement and education of minimum passing distance with senior representatives of NSW Police, the NSW Centre for Road Safety and Bicycle NSW,” Ms Dunn said. Bicycle NSW General Manager for Public Affairs, Bastien Wallace, noted the commitment of the senior Police in charge of Roads Policing nationally to be briefed on cycling road safety issues. “On 2nd October we welcomed the chance to brief senior Police officers from every state and territory on our initiatives to address road safety issues for bicycle riders, which we did with We Ride Australia and the Amy Gillett Foundation,” she said. Australian cycling organisations have joined in a call to all states to conduct enforcement campaigns with the primary goal of education and raising awareness of the importance of leaving a safe distance when passing bicycle riders, supported by a visible demonstration by Police of the legitimacy of bicycle riders on roads. The video interview with the UK West Midlands Police, PC Steve Hudson, can be seen here: www.weride.org.au/what-we-do/resources/videos/. A 2017 report led by Dr Ben Beck[i] in the MJA called for measures, such as the lowering of speed limits in residential areas, to address the worsening of serious trauma for bicycle riders that has seen a more than doubling of major trauma over the last nine years. The 2018 report of the Inquiry into the National Road Safety Strategy[ii] raised serious concerns for the safety of bicycle riders (and pedestrians) on Australian roads and made recommendations to induce a ‘step-change’ with twelve recommendations that, if implemented, will transform road safety performance[iii]. The 2017 National Cycling Participation Survey revealed that around 3.74 million Australians ride in a typical week, and 8.23 million do so over a year[iv]. However, national surveys show that of the two thirds of Australians not currently considering riding a bike for transport, more than a half would if conditions were safer on our roads[v] and there were options to avoid traffic on separated paths. [i] Beck, B et al, Road safety: serious injuries remain a major unsolved problem. Med J Aust 2017; 207 (6): 244-249.